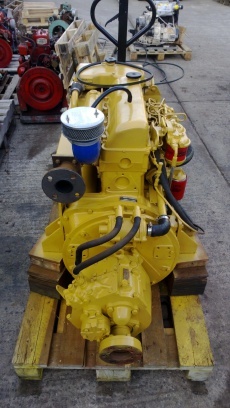 Lister Petter CS4 72hp Four Cylinder Heat Exchanger Cooled Marine Diesel Engine Complete With PRM 2:1 Ratio Hydraulic Gearbox. Marinised by Lister Petter but are essentially based on the very solid Ford 2722E industrial engine. We have a selection of these units available, all direct from the Ministry Of Defence due to replacement with more powerful units. All units start instantly with no excessive smoke, leaks, funny noises etc. All fluids are clean and in the right places. These engines are currently running 24V electrics but for an additional cost we can replace the starters and alternators with 12V units if required. Very solid engines with a great reputation among private and commercial operators alike.